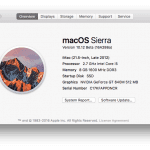 One of the things Mac users love about macOS are all the storage management suggestions that help Mac folks reduce the clutter and save valuable real estate on their hard drives. 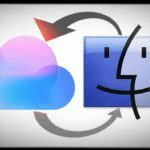 So when a Mac-fan starts getting low on disk space, macOS automatically uploads older and larger files to the connected iCloud account. And then, it deletes them from the Mac, leaving an alias that downloads files from iCloud when requested or needed. Pretty awesome! But let’s face it, our Macs have a heck of a lot more storage than our iPhones or iPads. And in iOS 11, Apple finally brings these storage management tools to our iDevices. So now, we all can optimize iPhone storage (or any other iDevice)! 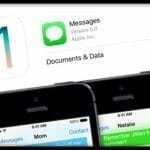 1 Your iCloud Relationship–It’s Complicated! 1.1 Older Model iPhone, No Problem! No Space on iPhone Even After Deleting Photos? There’s a delicate balance between iCloud and our iDevices. As our need for space increases, the native storage on our iDevices often doesn’t cut it! And that’s where iCloud enters the stage. It’s a great place to store things that usually take up a lot of data, like photos, videos, even presentations, and documents. The downside is you’re probably going to need to pay for an iCloud plan since the free account currently offers a meager 5GB of storage. The least expensive iCloud plan currently offers 50GB of storage for USD $.99/month–for most this amount is sufficient. But if take a lot of video and photos, you may need to upgrade to a larger plan, currently offered at 200GB and 2TB levels with pricing varying by location. Older Model iPhone, No Problem! 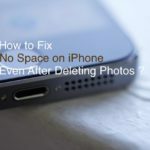 These storage features help people better manage their iPhone’s storage and are particularly useful for iFolks with older iPhones like the 5S and 6 models that have a very small 16GB of internal space. For iFolks with these smaller devices, we’ve all seen the dreaded “Storage Almost Full” message. 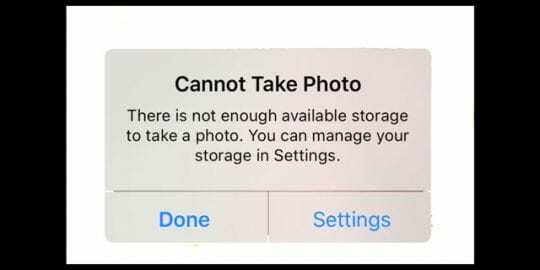 Without available storage, everything that makes the iPhone special goes out the window! You can’t take photos or film videos, no downloading new apps or app updates, and you can’t even install the latest iOS. Having no storage is no fun! So this iOS 11 feature is really handy in helping us all free up space through iOS’s personalized recommendations. And for folks with larger phones that love using memory-intensive activities such as playing game apps, taking Live photos, or filming in high definition (up to 4K) video, these new tools are for you. They should help you get a handle on how to do all your favorite things while keeping some space free for everything else, like updates and such. The great thing about iOS 11 is that it makes storage saving suggestions for you, uniquely based on your own iPhone, iPad, or iPod Touch. Instead of offering general tips, iOS11 customizes and personalizes its suggestions to best impact your own iPhone’s storage efficiency. 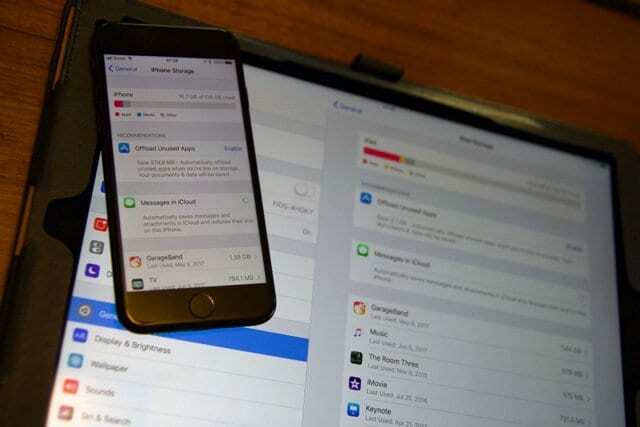 This includes things like moving images to iCloud Photo Library, Optimize Photos, Offloading Unused Apps, saving Messages to iCloud, Reviewing Large Attachments and Conversations, and others. It’s different for everyone. SO if your iPhone recommendations are not the same as your friend’s, that’s because iOS 11 is determining what’s best for you, not simply what’s best for everyone. When enabled, this recommendation removes apps when you’re low on storage. Although it deletes apps, it saves all your app documents and data in iCloud so recovery is easy. Basically, offloading apps saves app data to iCloud and then uninstalls the app itself from your iPhone or iDevice. When you reinstall these apps, iOS automatically syncs back your data so you pick up where you left off. The only caveat is that if the app is no longer available on the App Store, recovery is not possible since you are unable to reinstall the app that drives the data. For any apps where losing data means something such as games, offloading is a great option for iFolks facing storage issues. Not all your apps need offloading such as Google Drive and other apps that already store data in the cloud. For everything else, offloading is a good option to save space, comfortable in the knowledge that your data is backed up. And it’s ready to reinstall later with everything intact. 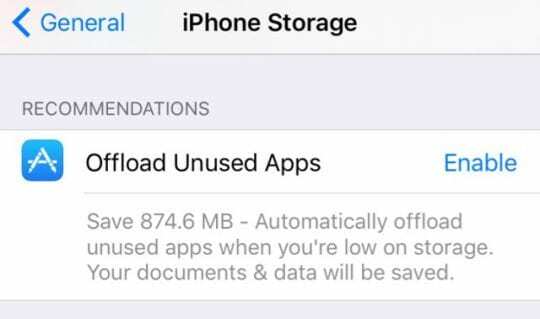 To enable this offloading feature, go to Settings > General > iPhone (or another iDevice) Storage > and tap Enable next to Offload Unused Apps. Or go to Settings > iTunes & App Stores and toggle it On or Off from there. Once Offload Unused Apps is activated, it works in the background and detects all your unused apps. 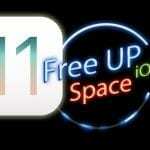 So when it finds that your space is low, it removes those little-used apps from your iDevice with no fuss. We think this feature is totally awesome! There’s also a way to pick and choose what apps your iDevice offloads. 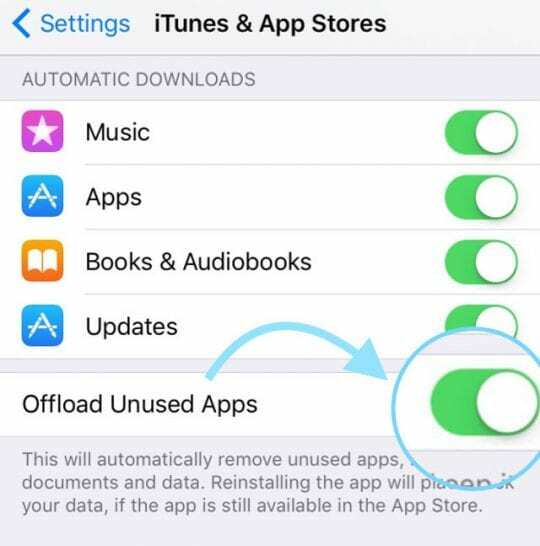 Remember that Offload App lets you delete an app BUT keep all the app’s documents & data. And it’s easy to do this on your own, without the assistance of an auto-bot. And once you decide you want that app back, all you need to do is tap on the deleted app’s icon (shows a cloud icon next to its name), and your iPhone restores it with all your data intact! So for apps where you need to keep data, like games, this option is very welcome indeed! Even use it with heavy hitters like iMovie and GarageBand that tend to take up a lot of space just for the App Data. It’s available for almost any app–but not Photos or Safari. But here’s a SNEAK PEEK at what’s coming with Message in iCloud. This feature is still a works in progress. But it one of those features that a lot of people want and have requested over the years! When it’s ready, Messages in iCloud syncs all your Messages on all your devices and Macs by just logging into iCloud on those other devices (and computers)! So if you delete a message on one device, like your iPhone, it’s now deleted on all your iDevices and your Mac as well. Yes, deleting a message on one device will delete it across them all! To date, we need to erase messages manually per device and often we receive notifications for the same Message, just on different devices. Starting with iOS 11, Apple intends to store and sync all our Message conversations via iCloud. So no more third-party apps or utilities to save and retrieve our Messages. iCloud and iOS 11 do all this for us, including full chat archive synchronization. 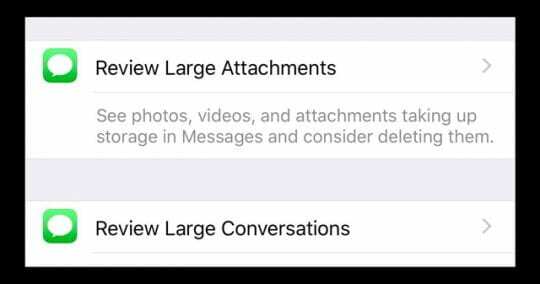 With iOS 11, there’s no need to store old Messages locally, and that opens up a lot of space on your iPhone. And transferring your Messages to a new iPhone or iDevice is no longer painful and arduous. With iOS 11 installed, iCloud keeps all of your old Message conversations for full retrieval when needed or desired. And for those concerned about privacy and security, Messages in Cloud remains encrypted end-to-end, so no one but you and your recipients reads those Messages. 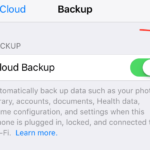 Find Massages in Cloud in Settings > General > iPhone Storage > and tap Message in iCloud. Alternatively, go to Settings > Messages and toggle ON Messages on iCloud. 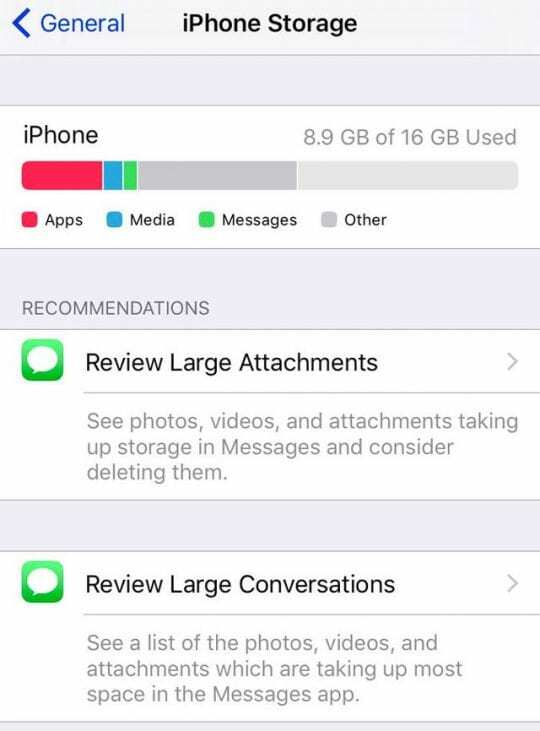 When you store your Messages in iCloud, your device only needs to cache the most recent conversations. And that frees up your phone’s storage space! As a bonus, your iPhone backups are now also smaller, so it takes less time to backup your iDevice. 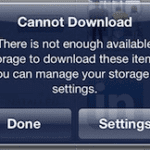 These recommendations are really the sweet spots for reducing your iPhone’s storage mass. If your personal recommendations include Review Large Conversations or Large Attachments, head here first. All it takes is a tap on the Review arrow to see a list of your largest attachments or conversations. From there, you choose what stays and what goes. It’s that easy! Often, the things that pop-up are attachments or conversations we’ve simply forgotten are still there. To delete these, just swipe on the item and select delete. That’s it! 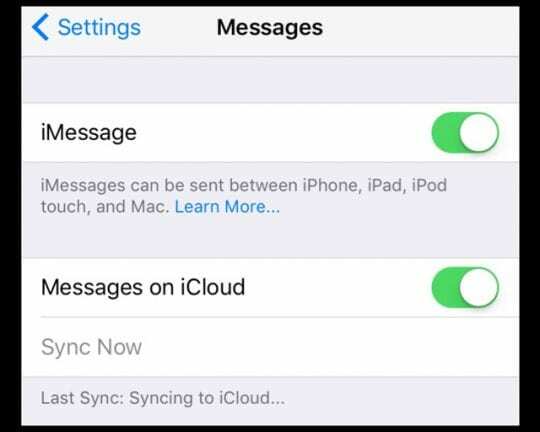 If you’re removing a conversation but want to archive it, make sure you turn on Messages in iCloud before deleting. And for those large attachments, save them to iCloud too or Dropbox, Google Drive, etc. before deleting. That way, all your conversations, and attachments are saved somewhere, just in case you need them. If you don’t, just swipe, select delete, and you’re done. Okay, we all know that all those pictures and videos take up a lot of our iDevice’s space. But did you know that by default, all your photos are stored in their original, high-resolution version? 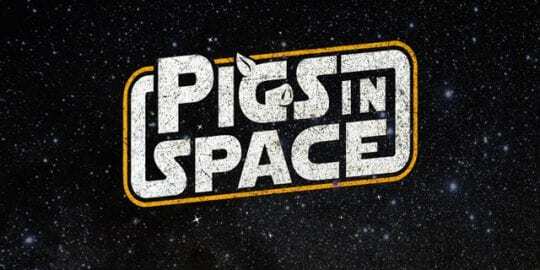 Consequently, they take up a lot (I mean A LOT) of space on your iPhone, iPad, and iPod Touch. But there are two Photos Settings that help you get a handle on things. 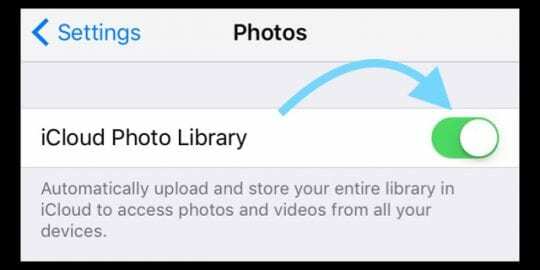 First, with iCloud Photo Library enabled, you free up space on your device, and your entire collection is accessible, from any device or computer. When you make changes to your photos on one device, all your other devices update automatically. 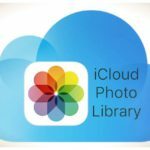 iCloud Photo Library isn’t just for iDevices, it works with your Mac, Windows PC, and Apple TV too. So sharing photos is easy. Next, there’s a great setting called Optimize iPhone (or another iDevice) Storage within Photos. With Optimize Storage ON, smaller & space-saving photos and videos are stored on your device while all your original and full-resolution versions are stored in your iCloud account. 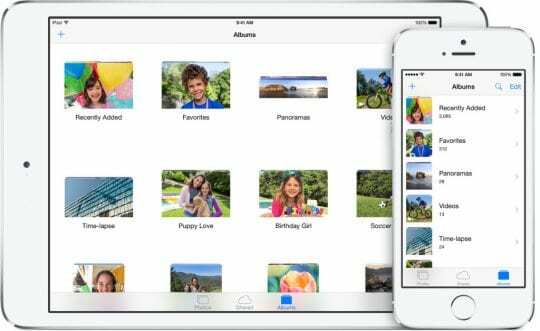 As long as you have space in iCloud, you can store as many photos and videos as you want. And Optimize Photos works when you need it and not when you don’t. 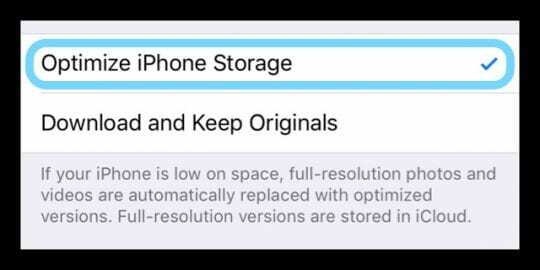 As long as you have enough iDevice storage, recent photos, and videos stay on your device at full resolution. And if an image is optimized, downloading the original photos and videos is simple over Wi-Fi or cellular whenever you need them. Another of iOS 11’s storage recommendations is to permanently remove any photos or videos that are in your Recently Deleted Album in Photos. 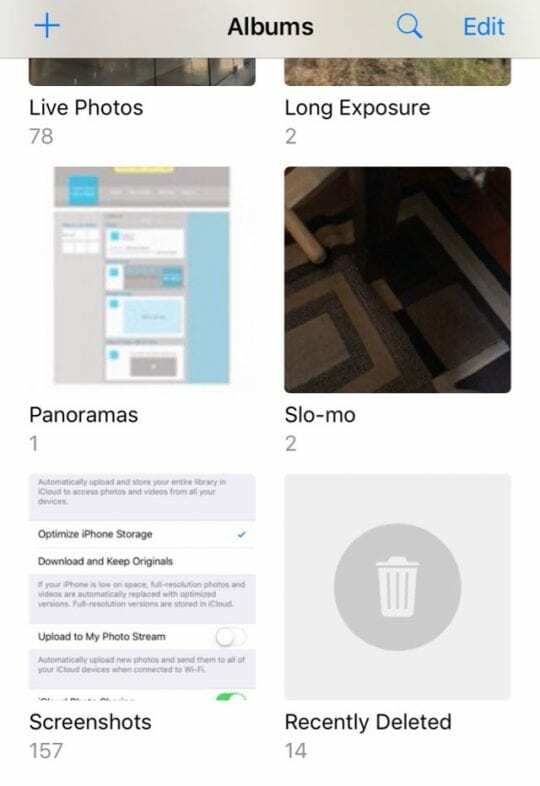 One of Photos default features, Recently Deleted stores all the pictures and videos that you manually deleted in your Photos app. With no further interaction on your part, images and videos are removed from this album after 30-40 days in sort of a waiting room. To quickly free up space, iOS 11 recommends deleting all the images in this album rather than waiting 30 days post-deletion decision. You can do this in one fell swoop or image by image. Open your Photos app and tap on Albums at the bottom of the screen. Select Recently Deleted from the album list. Photos prints all your photo thumbnails with the number of days remaining until deletion. 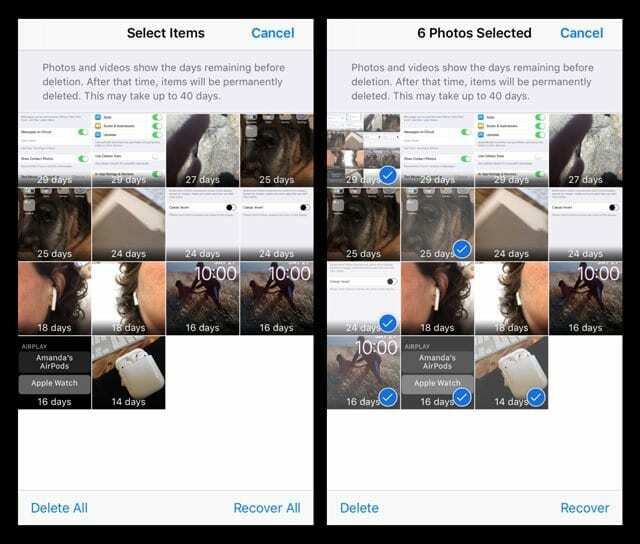 If you only want to get rid of a few photos, manually tap on each picture and tap Delete in the bottom left corner. Your iPhone Storage Recommendations can save you a lot of space by storing your content in your iCloud account. So when storage space is needed, iOS stores your photos, movies, text messages, email attachments, and other files in the cloud automatically. These recommendations take a lot of the work out of finding space and knowing where to trim your iDevice’s fat! However, if you find that despite the recommendations, you still need space, take a look at our article on the steps to manually clean out your space hogs!